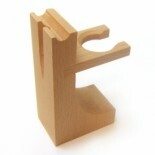 A great gift idea for the man on your list, this wooden shave stand will make shaving a treat. Dual function design allows room for a razor and a brush to store and air dry naturally. Made of hardwood with a light honey finish. Holds both a razor and shaving brush.